A routine trip to the vet begins a wild adventure when Suzy Maycomber and her cat, Snowball, take a shortcut through the cemetery and find themselves in the mystical land of Nightshade, where magic exists and cats talk. Only the librarian, Rachel, the most powerful witch in Nightshade, can help Suzy get home. One big problem: Rachel's just been murdered. 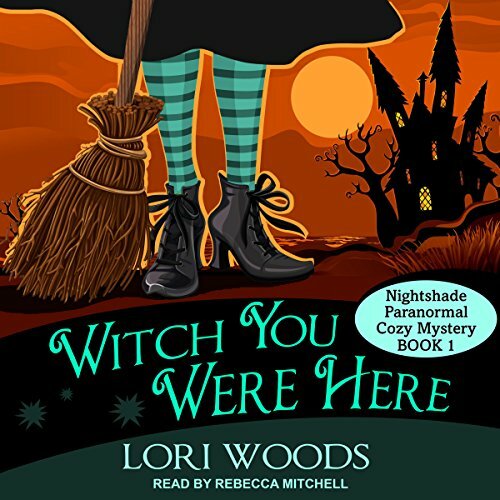 Desperate to find her way home, Suzy reluctantly agrees to take Rachel's place as Nightshade's resident witch, where she'll have access to the spell books that might hold the answers she needs. But her search for the truth draws Suzy ever deeper into danger. There is someone - or something - in Nightshade that doesn't want Suzy to get home. Rachel's murderer is prepared to kill again - and Suzy may be next. If Suzy wants to get home, she'll have to learn to be a witch first. I really like this series. There are parts that have me laughing out loud. It’s fun not serious. The narrator is great. I’m glad I found this one! Lori Woods created a wonderful fairy tail story with original characters. If you’re a cozy mystery fan you won’t want to miss this one. The story has great potential. Seems the writer is young. I can not wait to see the story unfold.